It’s been a roller-coaster week. The beginning of the week was really rough but encouragement from friends helped me recharge a bit. After a few examples like this, I asked students to work in groups and then come to the board to write out the answers to some problems involving the distributive property. 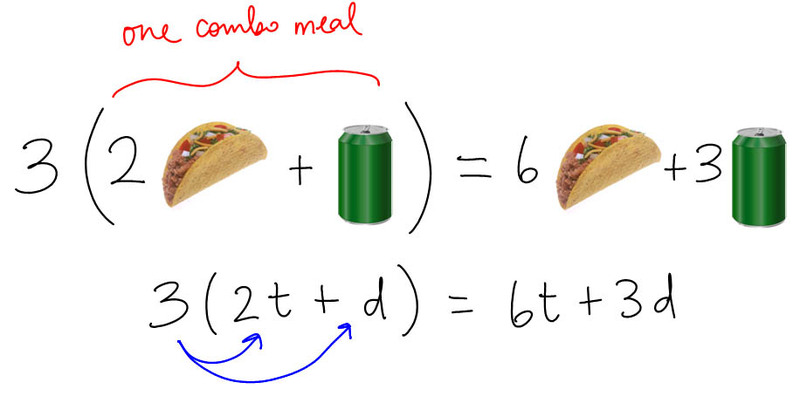 Either they already knew about the distributive property, or the food analogy helped. One week left before Winter Break. Nice one D! Oh and also, your algebra 1 students are now operating at a 2nd year QUT level! I so just totally stole this. My last example: 7 KFC family meals! Thanks for posting this! I’m writing a lesson plan in multiplying polynomials and incorporating this activity. I think using something they are familiar with will make the lesson more relatable and relevant!